There it was. One word. A statement. A stand. A declaration. Six months ago my dear wife wanted to define our life, tell our story. So she bought a painter’s canvas, went to our daughter, the artistic one in the family, and asked her to paint, paint one word that describes our life. Blessed. The word she chose is blessed. See the picture above. That’s it. That’s our word. Come to our house, look up on the mantle and there it is—Blessed. We are a blessed people. Our marriage, our family, our friends, our faith, our life’s work, there are so many dimensions to the blessed life we enjoy. We are blessed. We enjoy happiness, peace and provision. In our home, the blessed life we share is much more than mere provision. It is the sum of a lifetime of relationships. The blessings we enjoy are the result of people who have invested in us, much more than any investment we have made in ourselves. Yet I fear such words have lost their weight and meaning. In a culture where the blessed life is often confused with material abundance, we take words of blessing for granted, they’ve become commonplace—in an entitlement culture, many think blessing are deserved, to be expected. But living in a state of blessing should never be presumed or assumed. The fact of the matter is, though we all seek to live a blessed life, it can easily be lost. We can wander off the path, lose our way, face a crisis, find ourselves without peace, or happiness or health or provision. Deep down we understand this, that’s why we are all constantly seeking a state of blessing. The other day I was taking a walk; it’s what I do when it’s time to write. I walk. I walk and wonder and ponder and organize and edit. I also walk because it’s good exercise; I need the exercise, but I don’t do the exercise in place treadmill world. I have to go somewhere, do something, get something. So when I walk, I usually walk to the grocery store and back. Two miles, round trip, and a loaf of bread. 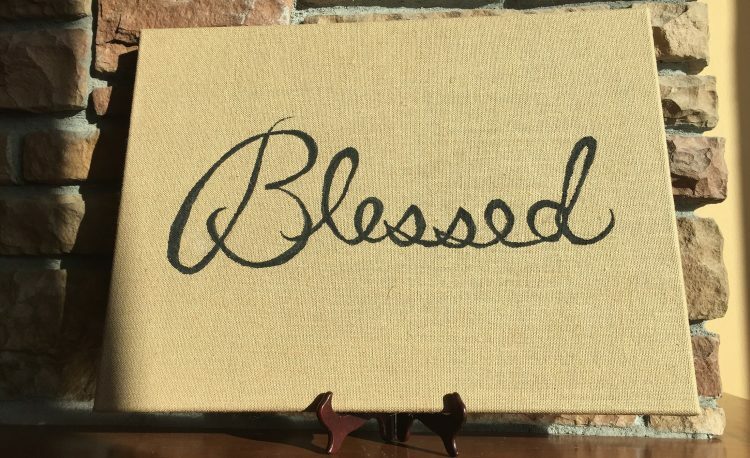 As I was walking, thinking about the dimensions of what it means to be blessed, I came across this sign, laying in the driveway to the grocery story. There it was. A sign of desperation. An appeal. A dire description. Human need etched on cardboard. A man seeking basic provisions for his children, life’s fundamental blessings. Ironically, at the end of his desperate, humbling appeal, he offers a blessing, God’s blessing, to those who gave. Since encountering that cardboard sign I have wondered and prayed about the one who held it. We have all seen far too many people holding similar signs. Oh how we take being blessed for granted, but that is an error, a false presumption. The truth is, each of us can easily loose the state of blessing we all desire. 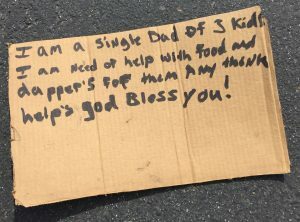 That man’s sign, his plea, is a symbol of our need for the basic blessings of life: for food, for clothing, for shelter, for safety, for work, for health, for transportation, for education, for nurture, for help and hope and just enough money to buy diapers for the baby. Here it is. My view. My belief. My perspective. We are responsible for one another. His cardboard appeal is a reminder, a testament to our fundamental need for common care. Without each other there are no blessings, blessings require a minimum of two. This isn’t an equation limited to gifts of charity from the wealthy and privileged to the poor and the marginalized. This applies to everyone. We are all people who require the care of one another. Those in conflict need a peacemaker, those who hunger require provisions someone else made, those who mourn need someone who comforts, those who have fallen need someone who restores. To live a blessed life we must learn the art of giving ourselves away for the good of others. A life spent hoarding and getting, is a hollow shell compared to a life spent serving and giving. This does not merely apply to the non-profit part of our world; it applies across back fences, and corporate offices. Teachers and bricklayers, engineers and executives, all of us doing our work for the good of one another. Each of us is called to spend our life being a blessing, because each of us has been blessed. Why write about this in a blog focused on helping organizations and the people in them? Because, in the midst of deadlines and projects, production schedules and client relationships, we must remember, the work we do matters. It is a part of the matrix of mutual giving and receiving that results in us being a blessing and being blessed. That’s it. Our life’s calling. We are blessed. We are in need of blessing. We are called to bless one another. It’s what I want to do every morning when I get up to do my work; it’s what you want to do in your work too. It is in our DNA, the DNA of humanity. It is a sign of life. The life we are meant to live. What Do Successful Capital Campaigns and A Bountiful Harvest Have in Common?